HAPPY NATIONAL PISTACHIO DAY! 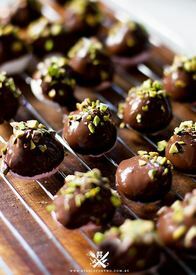 Try these easy Chocolate Pistachio Marshmallows!! 1. Melt the chocolate in a heat proof bowl over a saucepan with hot simmering water. Do not let the water get to the chocolate. 2. Once the chocolate is melted, add vegetable oil and stir well. Set aside and let it cool. 3. Roast the pistachios and roughly chopped. 4. Dip marshmallow in the chocolate sauce and make sure is well coated, then rest it on cooling rack. 5. Sprinkle chopped pistachios and let it rest until the chocolate is set. 6. Try not to eat all at once, like that is gonna happen.